Open Council Data is a project to release city council data as open data. In 2015 the Open State Foundation, the Interior Ministry and five municipalities worked on releasing council data, like agenda’s, bills and voting results, as open data. In the meantime we worked together with the Dutch Association of Municipalities in the Netherlands (VNG) to further the project. What has happened since then? And how can other municipalities release their council data as open data? Time for an update. The goal of Open Council Data is to release documents of the City Council as open data in a standardized way through an API. By re-using this data innovative apps can be made that strengthen local democracy. This can be done by giving more insight in the data, make analyses or to make civic engagement easier. Through the Open Raadsinformatie API more than 30.000 documents of seven municipalities can be found. The information is accessible for the larger public by means of the Open Council Data Search Engine. The project has become part of the Dutch Open Government Partnership Action Plan 2016-2017 and also part of the Digital Agenda 2020 of the Dutch Association of Municipalities (VNG). The project is now part of the VNG Pilotstarter. The Pilotstarter is a method to scale up a pilot in three phases. Around the summer the Open State Foundation has worked with the VNG in the first phase of the Pilotstarter. This phase was carried out with the City Council of Utrecht. With this municipality improvements were made for better re-usability of the data. Together with the City Council and their supplier the machine-readability of voting results, attendance, person registry and full-text search within bills and amendments were added. See the examples within the search engine and API here. Before this pilot it was impossible to retrieve this information from the open data and re-users were asking for these extra functionalities. The pilot with the Utrecht City Council was successful and now Open State and VNG are working together in the next step of the Pilostarter. The methodology we used with the Utrecht City Council will now be tested with other municipalities. Is it also possible to release this enhanced Open Council Data for smaller municipalities or with different software suppliers. And how can this project eventually be scaled up to all municipalities? 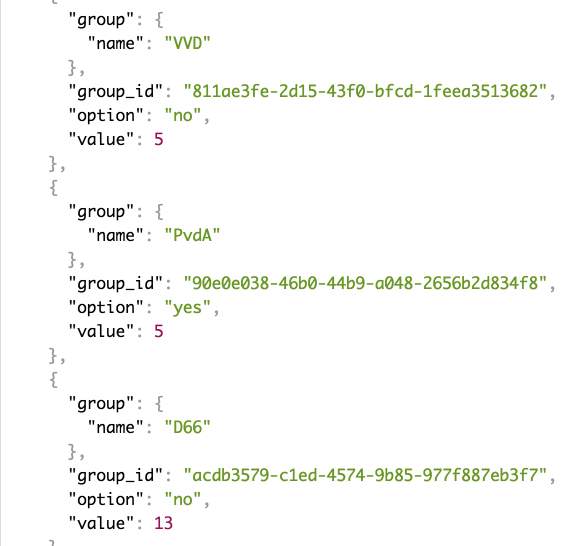 At the same time the VNG is working on a common metadata standard for Council Data for 2017. This goal is part of the National Action Plan. Out of the five big Council Data software suppliers, three suppliers are releasing and one is planning on releasing Council Data as open data through an API. It is still possible to join the current test phase of the Pilotstarter. If your Dutch municipality is interested please contact Tom Kunzler. In the meantime you can notify your Council Data software supplier that you are interested in Open Council Data. Questions? See this FAQ (Dutch) or re-watch the Open Council Data Webinar (Dutch).